Benjamin Earl Nelson was born on September 28, 1938. After a music career as a member of the Five Crowns and the Drifters, he went solo in 1960, taking on the stage name Ben E. King. That same year, he wrote 'Stand by me', originally intended for use by the Drifters, but they passed on the chance to record it. King then recorded the song himself, and released it as a single in 1961. It reached number 4 in the US Billboard Hot 100 chart. 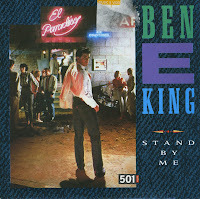 This single is a UK re-release from 1987 on the occasion of the track featuring on the movie 'Stand by me'. On this occasion, it reached number 1 in the UK and number 7 in the Netherlands.